Winter in our house is a time of reckoning for Phalaenopsis roots. 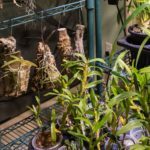 For several years, I struggled with a “boom” and “bust” cycle in my growing of Phals — expansive root growth, leaves, and flowering, followed by a winter decline and a cycle of repotting to clean up decaying roots. It took me awhile to figure out the annual issue with the Phalaenopsis, since they are reputed to be such easy growers and good orchids for the home. 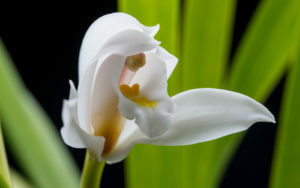 I didn’t have this problem with other orchids, even as I was just starting to get serious and learn about more genera. Well, I finally had the epiphany: the problem was my commitment to cutting greenhouse gas emissions. Translated: by saving energy with a winter nighttime temperature in the house of 57F, the roots were getting just too chilly. Our other orchids didn’t blink, but these temperatures sure made the Phals unhappy for three months or so of the year. 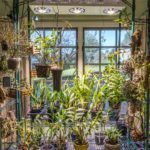 While I have to admit that Phals aren’t my favorite genera, and this might be the only place on the website that mentions them, I do have a commitment to take care of these beautiful orchids, many with interesting stories of how they joined us. 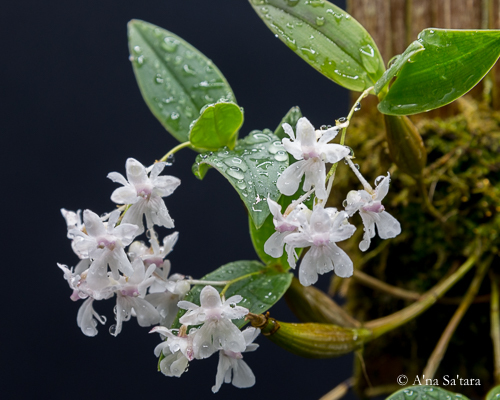 I am also indebted to them for learning a lot about the interactions of potting material, temperature, and humidity — and they are remarkably forgiving and regenerative orchids for that process. With another winter looming, and at last recognizing the detrimental temperatures, I decided to create a dedicated “warm” growing area for the Phalaenopsis, as well as a more hospitable indoor environment for my warmer growing Paphiopedilums and a small vandaceous orchid. My initial inspiration was my husband’s vegetable seed starting station, a stack of 48″ long shelves under fluorescent lights. While the shelves were too close together in his setup, the same company manufactured a two shelf version (see photo), with a distance of about 25″ from the lights to the tray. At the time, we debated between purchasing the fully integrated unit (frame, shelves, lights) or building our own. A mid-winter 20% discount tipped the balance in favor of the purchase rather than the DIY. However, in the future, I would make my own unit, having enough experience with this setup. Two shelf design: 48″ long shelves, 25″ between shelf and lights maximum. 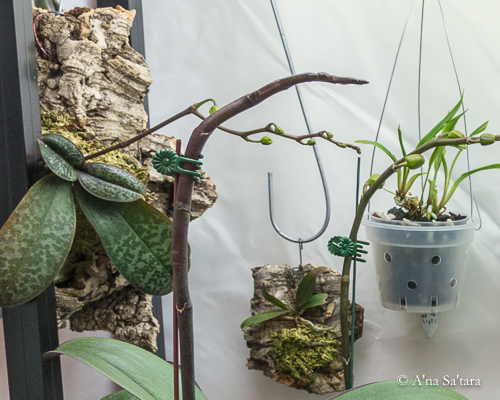 Four components have made this unit REALLY work well for orchids. So, no matter where you start for your frame and lights, these are the parts that I would like to share to enhance any indoor setup under lights. These are the fundamentals of the growing area: extra heat for the roots. Hydrofarm makes a long, narrow heating pad (48″x12″) that fits on shelf for a 2-3 fluorescent light ballast, which is what I am using here. They also make wider 48″ mats, if you are using more lights. I have a thermostat for each of the shelves, which I set at 70F. The temperature sensor is taped to an inverted ceramic custard cup, about 3″ above the bottom of the tray. I am aiming]to measure the temperature at the level of the middle of the pots. The heating mats turn off during the day, when the combination of room heating and extra heat from the lights increases the air temperature to 70-75F. At night, the heating mats run all night, and successfully maintain the root area at 60-62F. Initially, I set the pots directly onto the heating mats. Which worked adequately, except that the pots would dry out very quickly — every 2-3 days even in sphagnum moss. It was challenging to keep even moisture, and the smaller pots (3-4″) would desiccate in a day or so while the larger (5-6″) pots were still moist. I was watering very frequently, and it was much more convenient to be able to water the pots while sitting on the tray, rather than constantly carrying orchids to the sink. However, they would be standing in water afterwards. No good. The solution? Cut custom humidity trays from the “egg-crate” plastic grids sold for ceiling lighting at Home Depot. They are only about 1/2″ high, but enough to keep the pots out of the water. The pots are still close enough to the mats to stay warm (see thermostat above), but not in direct contact. Comparing one winter without the humidity trays, and subsequent years with them, the results with the humidity trays are much better. The moisture levels are even (watering every 5-7 days) and it is more amenable to keep mature, larger Phals in Orchiata bark (to reduce repotting frequency compared to sphagnum moss). In the summer, I remove the heating mats and just use the humidity tray on the shelf. 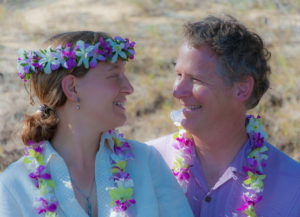 Summer in California is the dry season, and creates the most humidity challenges. I will often fill the shelf tray with enough water to keep it just below the top of the humidity tray and the pots out of the water. I found if I left the heating mats in the tray, water would collect underneath and get rather yucky. Each shelf has its own small 1.5W USB powered fan, which runs all day with the lights. 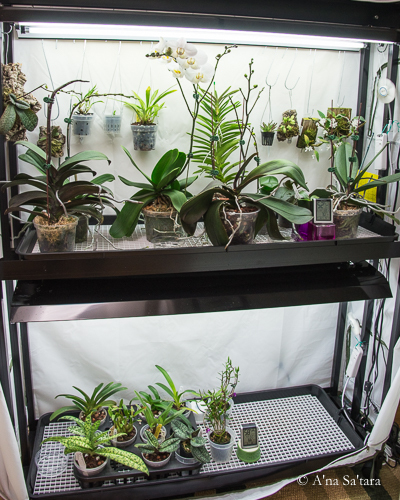 It is positioned on the top third of the shelf height, to maintain a constant light airflow over the orchids. Even though the unit is fully enclosed in plastic (with an open mesh top and slits on ends), I have had no problem with the air quality. It has been adequate for a Pleurothalliopsis and Dryadelia which also share the space, and are known for their preference for good air movement. I am using the tiny plastic USB fans sold as personal desk fans, designed to plug into a computer. One $7 fan has run for about 5,000 hours without failing. There are larger clip fans, but these are a bit much power for a small enclosed space. If I did not have the unit enclosed in plastic, then I would consider one of these instead. Mounted Phal stuartiana, Phal appendiculata, and Kefersteinia koechlinorum hanging on the frame. The two large bloom stalks in the foreground are from potted Phals below. This was an unintended but exciting feature of the frame! I discovered that I could hook standard greenhouse “S” hooks around the top bar and ends, creating an elevated area for mounted orchids or hanging pots. Nearly doubling the growing space! 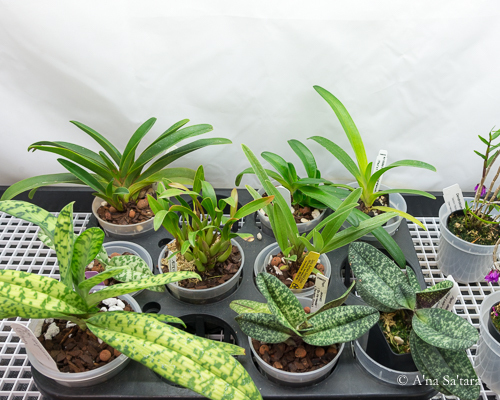 An eclectic group of warmer growing mounts have had great growing success here, with two species Phals, several Kefersteinia, the pleurothallids mentioned above, and Dendrobium aberrans. Since they are closer to the lights, it did take a little adjustment (and a few purple leaves) to get the height right for each orchid. 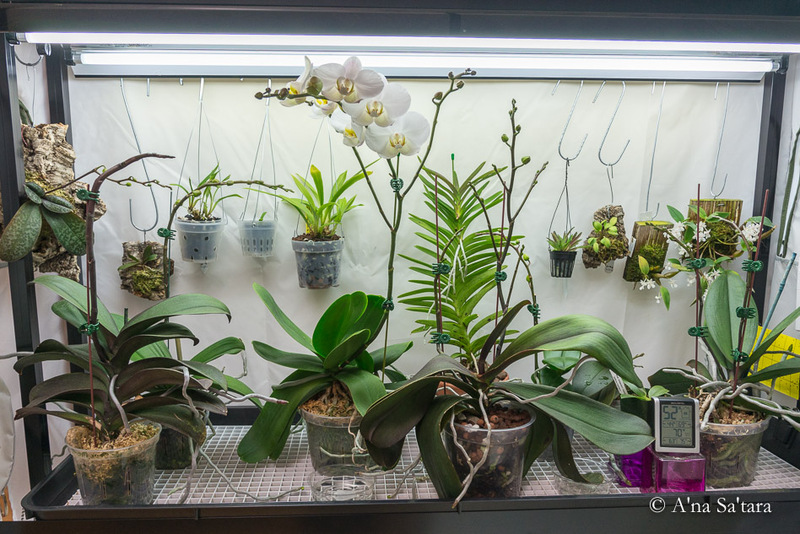 I have never seen an indoor orchid shelving unit setup like this for mounts — I urge you to give it a try. It makes watering quite easy as the shelf tray catches the overflow and it becomes the day’s water to evaporate for extra humidity. A few final notes on the setup. During the winter, I run the lights for 11 hours/day. For the summer, the maximum is 14 hours/day with tapering up/down during the spring and autumn. I am currently using high intensity T5 fluorescent bulbs. Just this past week, I discovered that there are now LED bulbs which retrofit into a T5 fixture; I will be investigating them as replacements for the future. Additionally, while these fixtures have the capacity for three bulbs for even more light, I actually only use two bulbs. I tried (twice) with three bulbs, but it was too much light for the Phals. While my lights are adjustable in height, I have never lowered them from the highest position for the top shelf. As noted above, I haven’t seen a need for the Phals, some of which have turned a bit purple from light levels near their tolerance threshold (even white flowered hybrids). All of them are flowering and growing strongly. Which is fortunate, because it would be difficult to lower the mounts and undesirable to increase their light exposure. I might increase light for the Paphiopedlilum on the second shelf; these photos were taken just after they moved onto the shelf and I wanted to let them adjust to the new growing environment (they spend the summer and autumn outside). 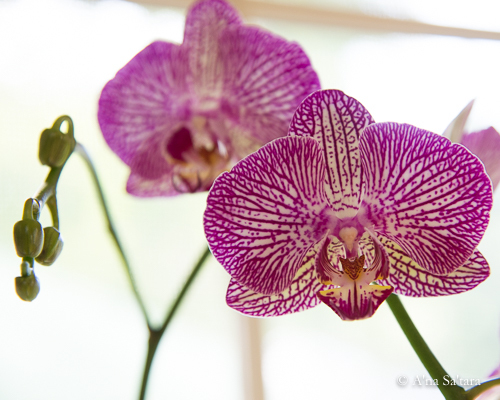 I hope that my experience supports you in desiging an optimal growing area for your orchids. 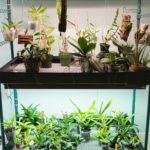 With just four feet of space in a wide hallway, I was able to create an excellent warm growing area for a few dozen orchids, potted and mounted. As you can see in the top photo, vigorous plants and many Phalaenopsis flower stalks are the reward for the effort!